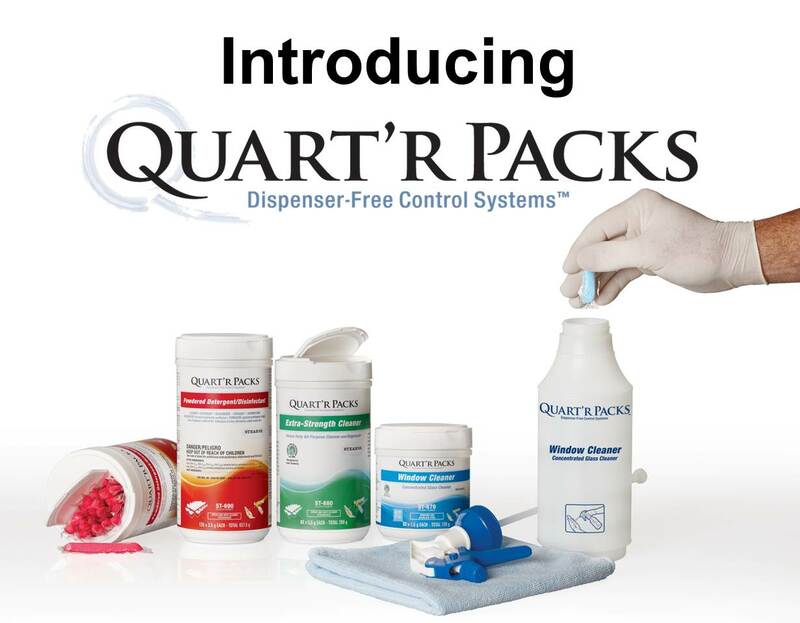 Introducing Quart'r Packs®, a quicker and simpler dilution control system for spray-and-wipe cleaning. A complement to our Water Flakes® line, each packet of Quart'r Packs® dilutes with one quart of water. Containing exact portions of powdered cleaning concentrates, Quart'r Packs® are packaged in water-soluble film. They dissolve quickly in water – no pouring, measuring, or opening packets. Just drop one Quart'r Packs® packet into one quart of water, and you are on your way to a cleaner and greener facility. Quart'r Packs® are packaged four small tubs per case. Or, choose one tub and one silk-screened color-coded bottle per case.